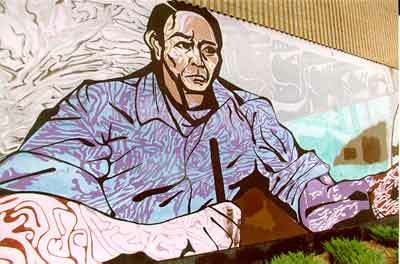 Over 30 years ago, 6 young artists in Pilsen were commissioned to create a mural on the east side of the new high school in Pilsen, Benito Juarez High School. The Mexican community had fought long and hard to have this new school built. To reflect this struggle, the artists created, A LA ESPERANZA a large mural which evokes the struggles and aspirations of Mexican youth and families. The mural is in the finest traditions of the great Mexican muralists, Orozco, Rivera, and Siqueiros. Five of the original artists are now professional artists, creating original art, sculptures, murals, and other forms of creative expression. This exhibition brings them back together for the first time, to showcase some of their current work. JIMMY LONGORIA, OSCAR MOYA, MARCOS RAYA, ROBERT VALADEZ, SALVADOR VEGA: Each artist could easily exhibit a "One-Man" Show, but all together, that's a Blockbuster exhibit. CARLOS & DOMINGUEZ Fine Arts Gallery is proud and honored to present this unprecedented exhibit to Pilsen and Chicago.